With its stylish looks and clever features, the all-new 2017 Chrysler Pacifica is one of our top picks for a minivan this year. The 2017 Chrysler Pacifica is an all-new minivan. In effect, though, it's the replacement for the previous Town & Country minivan, which Chrysler has discontinued. Easy to transform from people hauler to cargo hauler; upscale interior; roomy third-row seat; many convenience and luxury-based features available; class-exclusive hybrid engine option. If you've either been a passenger in or owned a steady flow of Honda Odysseys and Toyota Siennas throughout your life, you are forgiven for thinking that Chrysler minivans have largely existed in a state of perpetual rental fleet mediocrity. While Chrysler was a pioneer of the segment in the '80s, the last couple decades have been a lot more like the rolling equivalent of the Cleveland Browns or Wachowski movies after The Matrix. But here comes the 2017 Chrysler Pacifica. It's a new name for a new van, and get ready to reset your expectations. Sleek styling helps the new Pacifica stand out in this class. Chrysler had a crossover wagon/SUV named Pacifica during the mid-2000s, but there's no relation here. Instead, this Pacifica replaces the now-discontinued Town & Country minivan. That Chrysler is willing to shelve the name recognition of the familiar T&C is a hint of how different this new Pacifica is. It's built on a new light-yet-strong body structure and is wrapped up with svelte styling and a handsome-looking and well-finished interior. The Pacifica packs some cool new optional features, too, including a dual-screen rear entertainment system, automatic emergency braking, a built-in vacuum cleaner and an automated parallel and perpendicular parking system. Also interesting is the new Pacifica Hybrid variant. It's the first hybrid minivan on the market (plug-in variant or otherwise), and Chrysler says you can drive it up to 30 miles on electric power alone before it switches over to regular gasoline/electric hybrid power. All of this propels the Pacifica right in the mix as one of the top minivans on the market for 2017. Take a test-drive and we think you'll be surprised by how closely the Pacifica can match (or even exceed) the look, feel and performance of the segment all-stars, the Odyssey and Sienna, plus Kia's upstart minivan, the Sedona. It's also competitively priced, often coming in a couple grand lower for a similar mix of features. So, the Cleveland Browns wining Super Bowl 51? The Wachowskis making a superior Matrix sequel? Clearly, stranger things can happen. Just look at the 2017 Pacifica. The Chrysler Pacifica minivan comes in five trim levels: LX, Touring, Touring-L, Touring-L Plus and Limited. The Pacifica Hybrid will be sold as Touring and Limited Platinum, but check back later for complete information on the hybrid. Starting things off is the Pacifica LX with 17-inch alloy wheels, LED daytime running lights, heated mirrors, keyless ignition and entry, seven-passenger seating, folding/collapsible second-row seats ("Stow 'n Go"), a 60/40-split folding third-row seat, an eight-way power driver seat, three-zone climate control, a tilt-and-telescoping steering wheel, an electric parking brake, a 5-inch center touchscreen display, a rearview camera, Bluetooth, voice commands, Uconnect Access and a six-speaker sound system with USB and auxiliary inputs. Power sliding rear doors are a large component of what makes a minivan so versatile. Moving up to the Touring gets you those features plus power sliding rear doors and satellite radio. The midgrade Touring-L adds on a power liftgate, fancier exterior trim, foglights, rear parking sensors, blind-spot monitoring, rear-cross traffic alert, LED taillights, a security alarm, automatic climate control (three-zone), leather seating, heated front seats, a heated steering wheel and added storage for the first-row floor console. You get even more with the Touring-L Plus. Its features include the above plus upgraded headlights, an eight-way power driver seat, an upgraded driver information display, ambient interior lighting, second- and third-row sunshades, heated second-row seats, an 8.4-inch touchscreen, a 13-speaker sound system and a second-row rear entertainment system with dual 10-inch touchscreens, a Blu-ray player and additional USB and HDMI inputs. Finally, there's the Limited. The entertainment system is optional here but otherwise it has all of the above, plus 18-inch wheels, a hands-free liftgate and sliding door functionality (late availability), two sunroofs (panoramic for the first two rows and an additional fixed sunroof above the third row), xenon headlights, LED foglights and power-folding mirrors. On the inside you get driver memory settings, upgraded ambient interior lighting, a navigation system, upgraded leather upholstery, ventilated front seats, an in-vehicle vacuum cleaner and power-folding functionality for the third-row seat. Many of the features of the upper trim levels can be added to the lower trim levels as options. Other major options include 20-inch wheels, a removable center second-row seat (boosting passenger capacity to eight), a 20-speaker Harman Kardon sound system and a tow package. Every 2017 Chrysler Pacifica comes standard with a 3.6-liter V6 that develops 287 horsepower and 262 pound-feet of torque. That power is sent to the front wheels through a nine-speed automatic transmission. Automatic engine stop-start functionality (to help save gas when you're not moving) will be added midway through the model year. EPA-estimated fuel economy checks in at 22 mpg combined (18 city/28 highway). This is an average number for the minivan segment. For the Pacifica Hybrid, Chrysler will use a special version of the V6 combined with a pair of hybrid motor/generators fed by a 16-kWh floor-mounted battery pack. An estimated 260 hp flows through a special continuously variable transmission. Chrysler expects the hybrid to be able to travel up to 30 miles on electric power alone before it switches over to regular gas/electric hybrid operation and claims an 80 MPGe estimate. As with other hybrids, some battery recharging occurs naturally when braking or coasting. The plug-in nature of the van means its battery pack will be primarily recharged from a power cord, however. With a 240-volt charger, Chrysler says recharging a depleted battery will take just two hours. Properly equipped, the regular Pacifica can tow up to 3,600 pounds. Standard safety equipment for the 2017 Pacifica includes traction and stability control, antilock disc brakes, side curtain airbags, front seat side airbags, driver and front passenger knee airbags and a rearview camera. The antilock brake system also includes a couple extra features, including periodic brake-rotor drying in rainy conditions and automatically snugging the brake pads to the rotors when the driver abruptly lifts off the gas. The subscription-based Uconnect Access service includes emergency assistance, remote door locking/unlocking and vehicle location services. Rear parking sensors, blind-spot monitoring and rear cross-traffic alert are optional for the LX and Touring (SafetyTec Group package) and standard on all other Pacificas. If you're backing up in a Pacifica, the rear parking sensors have automatic low-speed braking functionality that can be applied when an object is detected and the driver takes no action. The optional Advanced SafetyTec Group package is optional for Touring-L Plus and Limited and includes automatic wipers, automatic high-beam headlight control, lane departure warning, lane departure intervention, forward collision warning, forward collision mitigation with automatic braking, adaptive cruise control, a 360-degree top-down camera system and an automated parking system (parallel and perpendicular). The Pacifica's dashboard has a modern and flowing look that's topped off by the new metallic rotary gear selector knob that looks and feels more upscale than the typical stubby minivan shifter. The Pacifica has an all-new look inside compared to the old Town & Country minivan. Chrysler has also adopted the more open feel of the Odyssey and Sienna by taking out the previous van's traditional center console and instead going with an open floor between the driver and passenger. This creates more available storage and the Pacifica now rivals the Odyssey for the best mix of cubbies, slots and bins. Interior materials quality is high, and the controls have a solid feel to them. Overall, the Pacifica looks and feels impressively upscale inside. The Pacifica also packs Chrysler's latest tech hardware. If you can, get the 8.4-inch Uconnect touchscreen. Uconnect is one of our favorite infotainment systems because of its crisp and clear graphics, quick processing and easy-to-use nature. If you do a lot of road trips with your kids, you'll enjoy opting for the new "Uconnect Theater" rear entertainment system. Besides having Blu-ray disc playback for the two 10-inch touchscreens mounted in the back of the front seats, the system also includes the ability to individually input various devices (smartphones, gaming consoles) and has a few built-in apps and games as well. One thing carried over from last year is the useful folding/collapsible second-row captain's chair seats, which Chrysler calls "Stow 'n Go." If you frequently need to switch from carrying people to hauling cargo, they are invaluable. Without much effort, you can individually fold the second-row seats and then store them in under-floor compartments (which can also be used for storage if you have the seats deployed). The only downside to these seats is that they're not quite as adjustable or comfortable as the second-row seats in rival minivans. A new addition this year is an available center seat for the second row that boosts the Pacifica's passenger count to eight. It's removable, but unlike the outer seats, there's no under-floor storage for it. In the third row is the class-typical 60/40-split third-row seat. It's more comfortable for adults than the old T&C's seat, though, and we think the Pacifica now has the most supportive and comfy seat in its class. Every Pacifica comes with second-row captain chairs than can be easily folded and stored underneath the floor. If you've got child safety seats installed in the second row seats, getting to the third row is easier this year. Passengers can still use the center aisle between the seats but there's also a second-row seat tilt feature that allows you to tip those Stow 'n Go seats forward without having to remove the safety seats. When you don't need the third-row seat, you can fold it down into a rear storage area. Power operation is an exclusive feature of the Limited trim level; just push a button and the individual seat sections can be raised or lowered in about 17 seconds. The 2017 Pacific boasts an agreeably smooth and quiet ride. Whether you're driving around town or heading out for a week-long road trip, the Pacifica will keep you and your passengers comfortable. It's also impressively quiet at highway speeds thanks to minimal amounts of wind, road and engine noise. Around turns, you'll feel like you have plenty of control through the van's steering, but ultimate grip is expectedly modest. 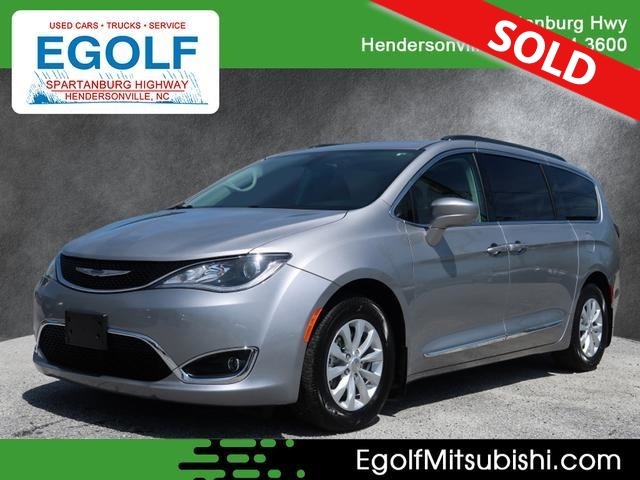 Smooth-riding, quiet and roomy, the 2017 Chrysler Pacifica is an ideal vehicle to take on the road with your family. We've yet to fully run a Pacifica through our official battery of tests but initial impressions of the V6 are largely positive. Hit the gas from a stop and the minivan scoots up to city speeds quickly. For the most part, you'll likely never notice that the Pacifica is picking from nine forward speeds, either. But there are times when the transmission can be hesitant to downshift, such as when you're rolling along and need just a bit more acceleration.